With the exception of playing recreational league soccer in my younger years, I grew up avoiding team sports. I was drawn to the more individual sport of skateboarding. For about ten years, skateboarding was my biggest passion. I loved the fact that I could go out, on my own, at anytime and try to perfect a new trick I had learned or even work hard to learn a brand new trick. I was never great but I was pretty good. It's what I did the most and could never imagine not doing in the future. I tried hard and saw results in new tricks landed. And while skating is an individual sport it's also extremely social. We went out with our other skating friends all the while suggesting ideas for tricks to pull off or features around town to skate on, around, up or down. A simple set of four stairs with its handrail could keep us entertained for hours, days even. We'd skate up to the stairs, ollie off, maybe do a kickflip or slide the rail. And then try to land on the board with all four of its wheels landing flat on the ground and ride away. Quite simply that was called, "landing it". Sure, anyone could ollie off the stairs and kick the board around so it flipped and spun but could you land it? That was the ultimate. Land it and ride away. For me, and most skaters in general, landing an advanced trick is few and far between. And if we landed one trick, could we land a second consecutive trick. And a third? That's when a skater is good...when he can string together multiple, difficult tricks and land them all. Most of the time I'd spend all afternoon, hour after hour, attempt after attempt, trying to land a single, more difficult trick. Most of the time I simply wouldn't land it but sometimes it would be worse than that--a slam. Not only not landing the trick but committing to it so hard that when it didn't work out, I'd fall and hit the concrete so hard it would take many minutes to recoup from the fall, the slam. While significant pain was inflicted in those slams it felt, in an odd way, great. I knew I had committed 100 percent to the trick and gave it my all, skin and bones be damned. One example of this mentality sits in my mind the most. I had just learned to heel flip my skateboard. While moving fast along the street I could pop off a heel flip and land it most of the time. The next logical thing to do was to try to heel flip down a set of three stairs I enjoyed skating at. One afternoon, after watching a particularly exciting new skateboard movie part featuring Gershon Mosley, I headed to the stairs determined to heel flip down them. The first few, or twenty, attempts were weak. Skate up to the stairs fast, crouch, pop off and flip the board with my heel only to let the board fly hopelessly out of control as I did my best to avoid landing on it so I wouldn't slam. As I cycled through more attempts I noticed that each time I got more comfortable with the motion and the idea. Progress was being made and I started to commit to each attempt a little more. A couple more times and I was landing with one foot on the board, one off and then slamming. The slams hurt but not enough to overcome the satisfaction I was feeling knowing that any one of the next few attempts could be it--I could land the trick. All I had to do was commit and try real hard. I skated back up the sidewalk, spun around and starting pushing fast, rolling towards the stairs again. Commit 100 percent. I popped the heel flip, stayed above my board, watching it flip one complete rotation under my feet, waited for the right moment and stopped the flipping rotation with my feet just as the four wheels reconnected with the smooth sidewalk and my knees compressed to absorb the landing. And with that I had landed it. It's no real wonder that later in life I gravitated towards rock climbing--an individual sport with numerous parallels to skateboarding. Sure, most climbers need a partner to belay them as they climb so it's not technically completely individual but when the climber is climbing, the action is individual. 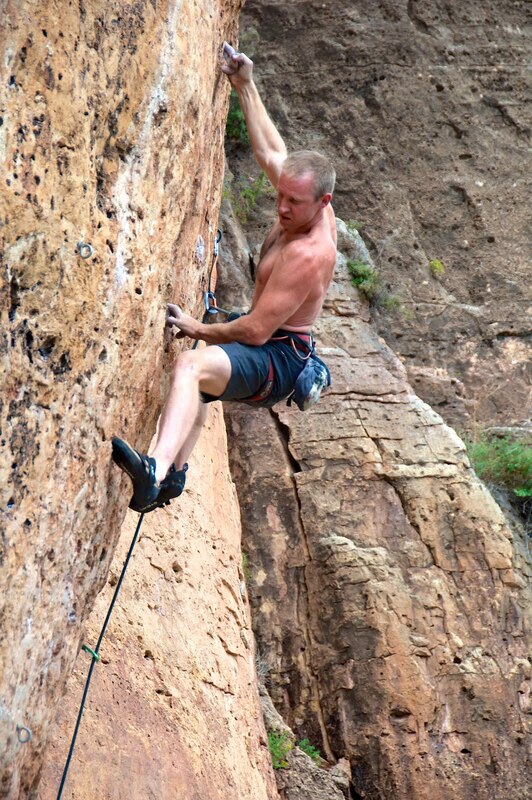 When I'm climbing I'm testing myself, physically and mentally, on the rock. Can I start at the base of the wall, find a route up the wall, moving from hold to hold, commit 100 percent and reach the top without falling off? 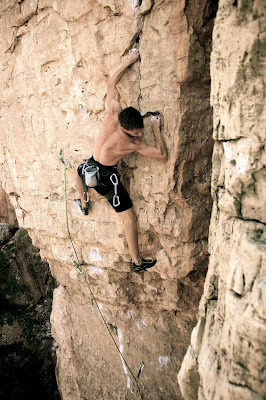 The comparisons between rock climbing and skateboarding are many. Like my skateboarding, I'm not very good at climbing either. But I try. And as I did on my skateboard 20 years ago on those three stairs and that handrail, I can spend hours, even days, at the same rock wall on the same route trying, over and over, to pull off my trick--to climb from the base of the wall to its top without falling. Trying to climb a new, difficult route I fall many times over. Thankfully, a fall while being belayed rock climbing is so much less painful than a slam on a skateboard. The rope stretches, my belayer gets lifted off the ground and the terrain below me is steep so I often don't even hit the wall. Climber Jenna Lupia on Meltdown. Photo by Lee Brinckerhoff. 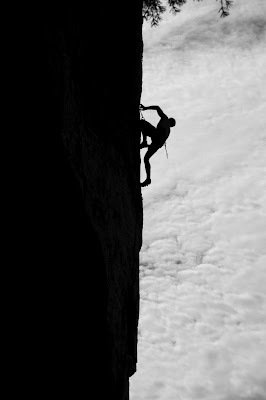 Climbers have a term called "projecting". It's defined as the act of picking a climbing route that's particularly appealing to the climber and that is difficult enough that the climber cannot climb the route, the first time, without falling on the route. More often than not, a "project" is a route that is rated harder than any other route the climber has climbed before. The project is a challenge for the climber and something the climber will come back to for many hours, sometimes even days, to try to climb without falling, much like my afternoon spent trying to land the heel flip down three stairs for many hours straight. Last week I went into full-on projecting mode on a local route called Meltdown at the Dungeon. Rated 5.12c, it's harder than anything I'd ever climbed before. I had tried to climb it a couple times, every now and then, over the past two years but always felt it was too hard for me. But last week I spent an evening trying to climb it with my friend Hagen. Meltdown was hard for us both and we both fell on the route many times. But we were close. We'd fall twice on one attempt and then only fall once on subsequent attempts. Each attempt was better than the previous attempt. We had found a new project. After each attempt we'd swap ideas and then added encouragement. We'd both send it next time for sure. Well, that next time resulted in one fall again. Every time, one fall. Then two nights later Hagen did it. It was awesome and encouraging to see that despite the route feeling nearly impossible the first few times, we could learn the route, climb it smarter and send it. It took me another night's attmepts before I really felt close to sending it. Five attempts in a row, ever two days, had each resulted in one fall on each attempt. Then, last Thursday night I made a change to my foot placements and that made the difference. I climbed up, thought about where my feet and hands needed to be and committed 100 percent. Falling didn't concern me. I didn't even think of it as an option. I grabbed the rock hard, pushed my toes onto the holds even harder, gritted my teeth and popped up. And with that I sent the hardest route I've ever sent. I had landed it. After last weekend's Taos Up and Over 10k run I was feeling a bit sore in my quads and my right heel so I took Monday off from running. Tuesday rolled around like any other Tuesday and I got to work around 7am. 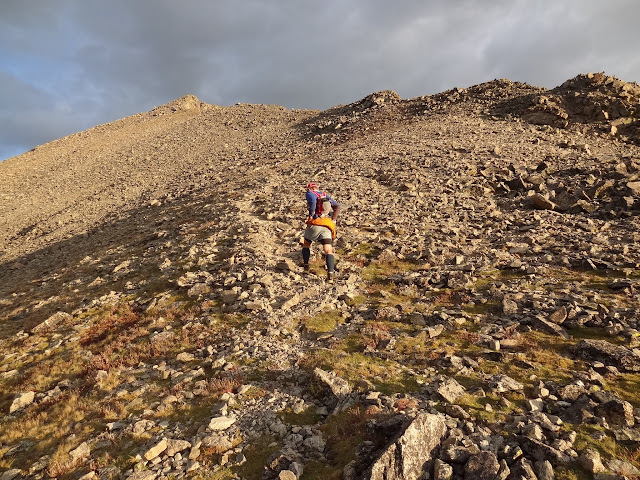 After getting through the morning's email I checked in on my friend Homie's progress on his 14er speed record attempt that he had started the previous Thursday. Homie was carrying a Spot GPS tracking device and watching him make great progress, via my computer, on his endeavor was extremely inspiring. 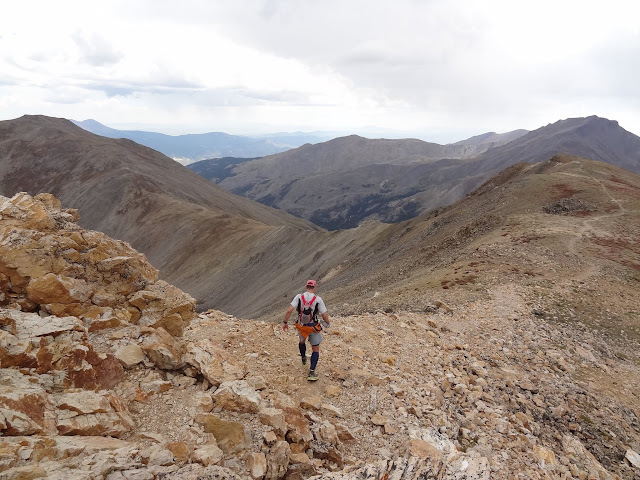 On Tuesday morning he was working up Mount Antero. I had hoped to meet up with him sometime during his attempt to give him some company and moral support but didn't have the vacation time. 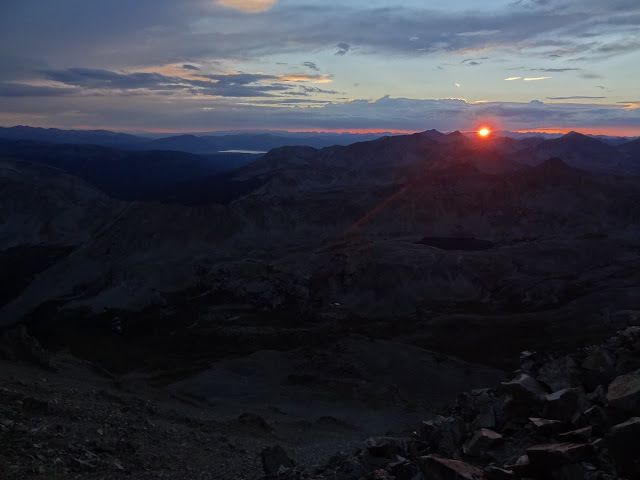 However, as I sat there at my desk watching his progress and reading all the positive, energetic posts on the 14ers.com thread about his adventure I just couldn't stand it anymore. I had to get up to Colorado ASAP to help out in any way I could. So I went home "sick", called Bill Wright (a member of his support crew), packed up my gear and headed north that afternoon. After a short nap and some food intake, Homie and Andy left the trailhead around midnight while Gerry, Jennifer and I all slept for about six hours. 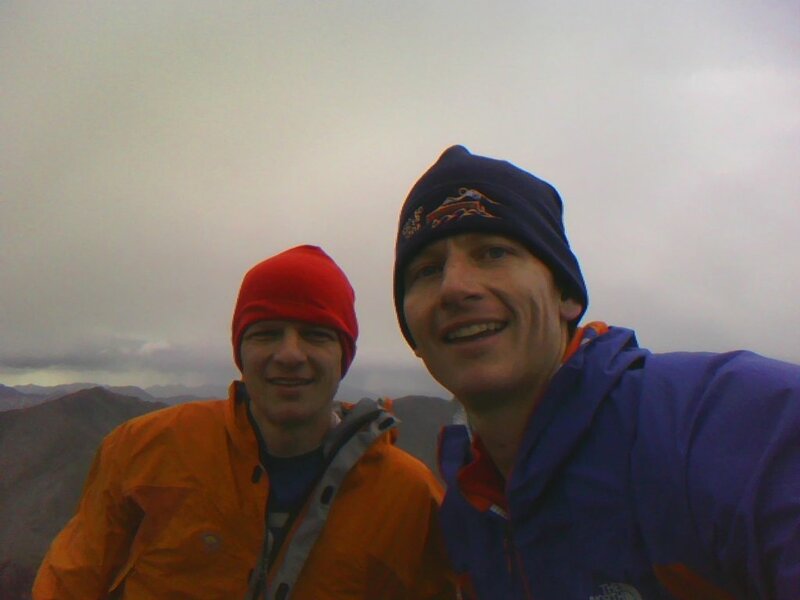 Homie and Andy returned to the trailhead at 6am and Homie was pumped! His enthusiasm was contagious and we cruised into BV for some coffee and a short breakfast before driving up to the Cloyses Lake TH. 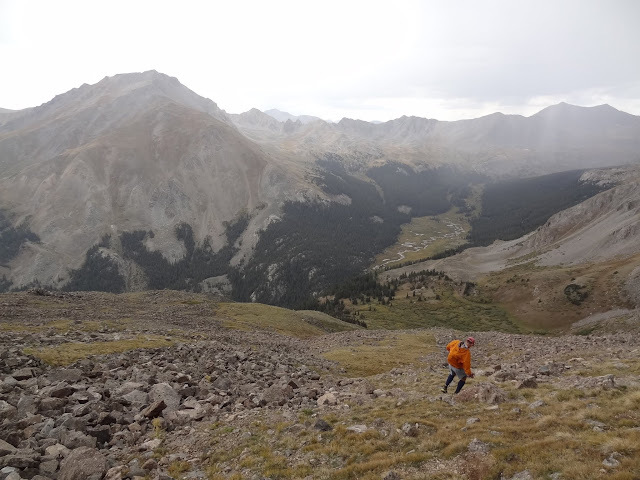 At 9am on Wednesday, Homie and I left the CloysesLake TH to traverse a major chunk of the Sawatch 14ers--Missouri, Belford, Oxford, Harvard and Columbia. I'd linked these up, along with Yale, many years ago from south to north so I knew we were in for a big day. Homie was looking strong, though, and I was confident we'd make good time. I hadn't really spent any time on the trail with Homie since August 2009 when I crewed for him, Bill and Tom in their first Nolan's 14 attempt and even longer since our February 2006 winter Crestones Traverse. Thus, we had plenty to talk about as we climbed over the peaks and headed south. We only encountered a couple of light rain showers during the day and minimal lightning. It was a great day as we summited Mount Columbia as the sun was setting. At the summit we were greeted by John Kedrowski who would hike with us down to the North Cottonwood TH to meet the crew. However, I had called in sick again to accompany Homie on this big day but had to be back in Los Alamos for work on Thursday. It was getting late and I still had a 4.5 hour drive home. I bid Homie goodbye around 8pm and then hammered down the super heinous south slopes route of Mt. Columbia and then ran the trail down to the trailhead getting to the awaiting crew (Gerry, Jennifer and Andy) around 9pm. I explained that Homie was still trucking along but his quads and shins were killing him on the descents so it would be another couple of hours before he would reach the trailhead. For me it had been an ~18 mile, 12 hour and 10,000' ascended and then descended day. I was a bit beat. With that, I loaded up and started the long drive home. I made good time and crawled into bed in Los Alamos around 2am Thursday morning. I was back at work at 7:15am Thursday morning after just a few hours sleep. Coffee was brillant on Thursday. Spending the day with Homie on Wednesday was very inspiring and fun. His demeanor, company and crazy-strong ability to keep on going made me really appreciate the opportunity I was partaking in. Sure, it seemed silly to drive 4.5 hours up to Colorado on whim to joining and I questioned my decision to drive up there a couple of times on Tuesday afternoon as I sped north. But once I got there and met up with Homie and his crew, there was no doubt in my mind I did the "right" thing. This was living and one never knows what tomorrow will bring so we'd better live right now. I've posted some photos from my day with Homie if you're interested. 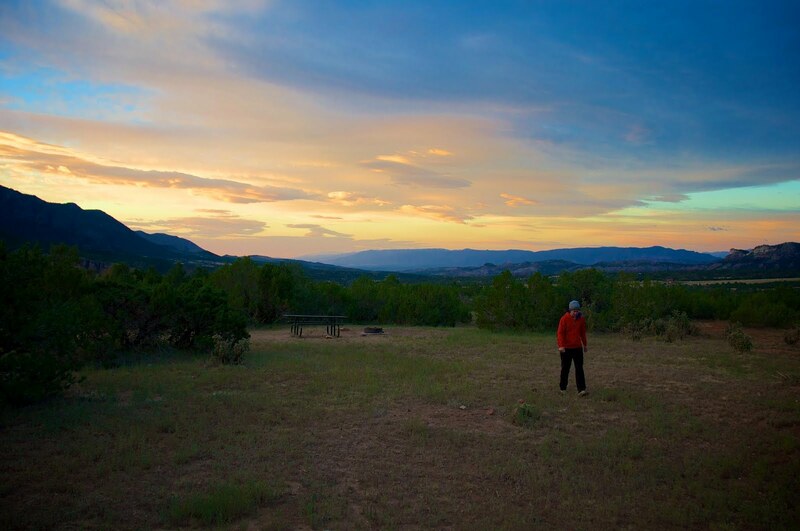 Thursday evening we left on our planned Labor Day weekend trip to Shelf Road, CO for 3.5 days of climbing. The six hour drive to Shelf made for a long Thursday to cap off a long, whirlwind weekend. I was very happy to crawl into my sleeping bag at Shelf Road and sleep for a solid 7 hours and then enjoy a relaxing and fun weekend of sport climbing on Shelf's fine limestone walls. I climbed well and onsighted a number of new-to-me 5.11s and, on the last route of the trip, sent a new-to-me 5.12a route called Helter Skelter. So the weekend ended on a fine note and capped a really cool, inspiring and rewarding week. Life is good. No, make that great. Keith giving the finger to The Gym Arete Direct (5.12c) at Shelf Road.